The seventh of eight children, Dr. Maureen Hurson grew up in central Washington state and attended Washington State University as an undergraduate. She pursued a career in the travel industry before discovering veterinary medicine as her true passion. Dr. Hurson completed post-baccalaureate training and a master's degree in Animal Science at California State Polytechnic University. From there, she attended veterinary school at the University of California at Davis, graduating eighth in her class. 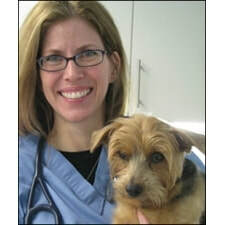 Joining her sister in the New York City area, Dr. Hurson completed a one-year internship in medicine and surgery at the Animal Medical Center before coming to work at City Veterinary Care in 2008. Dr. Hurson lives on the Upper West Side with her two cats, Josie (aka "Fat Girl"), an orphan whom she bottle-fed from two weeks of age, and Watson.